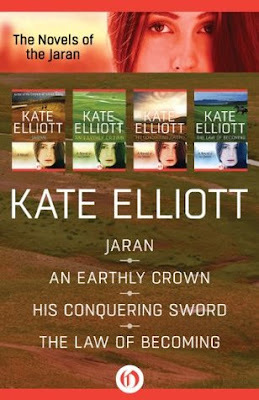 You can now download The Novels of the Jaran omnibus by Kate Elliott for only 3.99$ here. In An Earthly Crown, the nomadic tribes of the jaran are uniting the settled cities of their homeland one by one. Their charismatic leader, Ilya Bakhtiian, has his loyal wife by his side, but there is something about her he doesn’t know: Tess Soerensen is a human. Back home, her brother, Charles, led an unsuccessful revolt against the all-powerful Chapalii empire. Charles’s insistence that Tess join him is as strong as Ilya’s reluctance to part with his beloved wife—and neither considers that Tess may have her own plans for the future. As three fiercely independent spirits struggle for a solution, the fates of both the human race and the jaran hang in the balance. In His Conquering Sword, the jaran have been taking over towns and bending all non-jaran to the law of their rule. With Ilya Bakhtiian in charge, the nomadic fighters are now preparing an assault on the royal city of Karkand. But within the campaign, another struggle looms. Charles, the brother of Ilya’s wife, Tess, is still driven by thoughts of revolt. Charles travels to Rhui for key information about the past, hoping to bring back his sister—his only heir. And in The Law of Becoming, Charles Soerensen’s revolutionary inclinations have been reignited. In this final book, the story of Tess, Ilya, and Charles comes to its stunning conclusion as new generations get involved in the intrigue, Earth’s exiled jaran people resurface, and the Chapalii overlords make one last, unexpected move. looks like a romantic bs story, "twilight" in space. not for me.